Journal Reference: Cheng W, D Kim, and A Rowe. 2018. "Objective Quantification of Convective Clustering Observed During the AMIE/DYNAMO Two-Day Rain Episodes." Journal of Geophysical Research: Atmospheres, 123(18), doi:10.1029/2018JD028497. 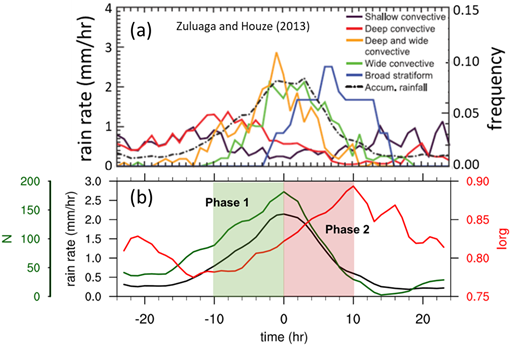 (a) The frequency of occurrence of each of the different types of radar echo structure during two-day rain episodes (Figure adapted from Zuluaga and Houze 2013). (b) The composite time series of rain rate (black line), number of convective elements (N; green line), and the Organization Index (Iorg; red line) of the same 10 two-day rain episodes. Phase 1 is identified by the increasing trend of N and Iorg; Phase 2 is identified by decreasing N and increasing Iorg. A schematic diagram of the evolution of the spatial distribution of convective elements in the two-day rain events observed in AMIE/DYNAMO. From (a) to (b), new convective elements are formed near the existing convective elements at the cold pool boundaries. From (b) to (c), the scattered convective elements that are not embedded within stratiform clouds dissipate quickly. The N and Iorg of each snapshot are given at the top of each panel. We successfully quantified the degree to which precipitating cumulus clouds are spatially aggregated at scales larger than the size of individual clouds by use of ground-based radar observations over the tropical ocean. We also found that the nature of convective clustering during the developing phase with increasing number of cumulus clouds is different from that of the decaying phase in which the number of convective clouds decreases. The computer models that we use for weather and climate prediction are unable to represent how organized cumulus clouds are because our understanding of the mechanism through which cumulus clouds aggregate is limited. Our results suggest a few specific mechanisms that need to be included in the computer models to correctly represent tropical cumulus clouds, and which will provide guidance to improve those models. To objectively quantify the degree of convective clustering (i.e., the spatial clustering of cumulus clouds) using scalar metrics derived from ground-based radar data, we first identify convective elements from radar reflectivity using a rain type classification algorithm. We then apply scalar clustering metrics to the identified convective elements to test their ability to quantify convective clustering during the observed two-day rain episodes. We found that, among other metrics, the Organization Index (Iorg) of Tompkins and Semie best captures the observed convective clustering. By inspecting the time evolution of Iorg together with that of N, the number of convective elements in the domain, we reveal two distinct phases of convective clustering during the two-day rain events, which we name Phase 1 and 2 clustering, respectively. In Phase 1 clustering, which corresponds to the developing stage of overall convective activity in the domain, N increases and the new convective clouds tend to form preferentially near the existing ones, leading to a higher degree of organization. In Phase 2 clustering, on the contrary, aggregation of convection occurs while N decreases with the environment being stabilized. We found that, during this decaying stage, convective clouds keep organized as they are forced to form over a limited area by mesoscale circulation associated with stratiform clouds.